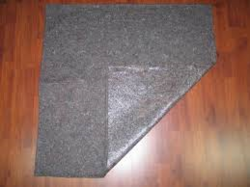 Prominent & Leading Manufacturer from Jaipur, we offer pvc backing felt. With Immense pleasure, we would like to introduce ourselves as the giants in the non- Woven [ Compressed Felts and non woven fabrics ( needle punch fabrics, chemical bonded fabrics and thermal bonded fabrics ) Manufacturing industrial entity for past two decades. We have established ourselves as a leading brand over the years in non- Woven segment owning to stringent adherence towards Core Competence and TQM.We can manufacture non woven fabrics upto width of 4. 5 mtr with GSM ranging from 70 to 1000 as per customer specification. We have a total manufacturing capacity of 120 tons/month of needle punch non woven fabrics.We specializes in manufacturing and supply of filter media for Air, liquid and oil. We manufacturer non woven fabrics which are lint free and provide the best results as per the customer requirement. We have been supplying filter media to a large number of filter manufacturers across country.We would not only provide you with high quality product but also would offer you competitive pricing and would offer you premier value- Added services. We believe in Customized product for Customer so that the product caters to the requirement of the customer in the most optimum manner and provides cost efficiency and quality.